The new range of products at @Home furnishings includes the Planter with Metal Stand in the domain of home décor. Now available in an emerald green colour, it allows an element of nature into your home. The planter is 20.3 cm deep and has a diameter of length 15 cm. The body of the planter has bands in which the shade of emerald gets progressively lighter from the bottom to the top. There are self-coloured geometric patterns on the body, which is made of terracotta. It is susceptible to breaking if handled roughly, but due protection is given by the metal stand that comes with the purchase. The stand is black, and holds the planter from all sides. The stand allows the planter to be kept at an elevated level than the surface it is placed on, making sure that the surface is not ruined. Use the planter to grow a small plant and include it in the sleek and elegant modern décor of your home. A bit of nature can only improve the look of the setting it is put in. You could put the planter on the metal stand and place it on your balcony, bedroom or living room. Placing it in the washroom for some aesthetic appeal is also acceptable. 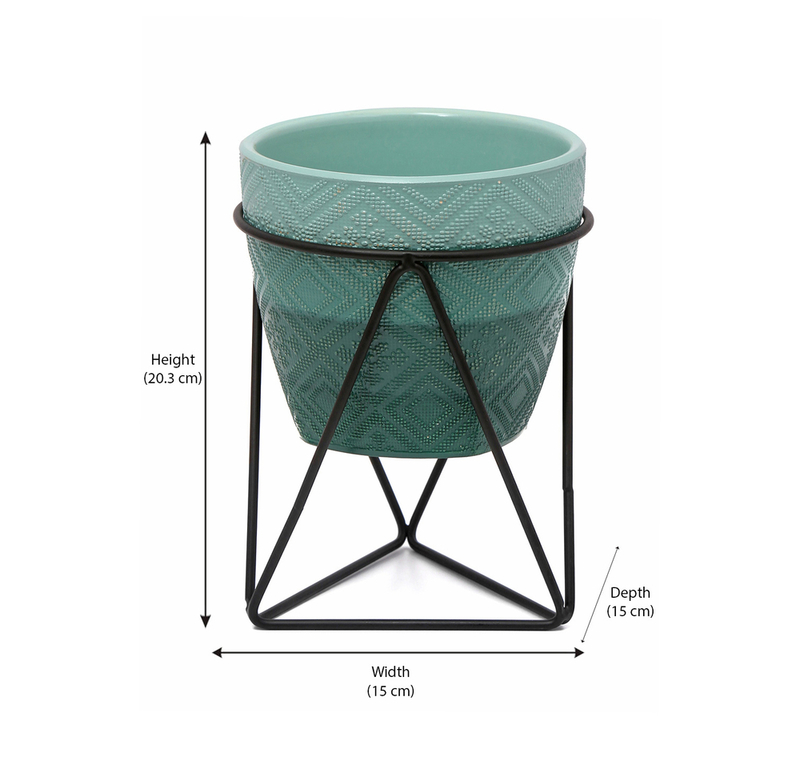 Purchase the emerald green planter today and compliment your home.